Fever pairs Bullet For My Valentine with producer Don Gilmore, best known for his work with Linkin Park and Good Charlotte. 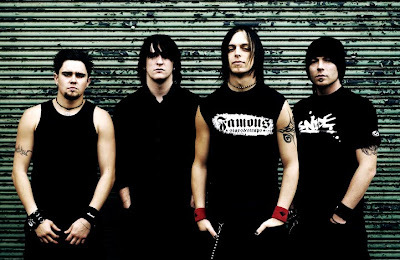 The Welsh band—vocalist/guitarist Matt Tuck, guitarist Michael Paget, bassist Jason James and drummer Michael Thomas--recorded Fever in studios both in its native Wales and Los Angeles The album follows 2008’s Scream Aim Fire, which debuted at No. 4 on The Billboard 200, a career high for the group, whom Kerrang! named Best British Band in both 2008 and 2009. Worldwide Scream Aim Fire has sold one million copies and debuted in the Top 5 in Germany, Austria, Australia and #1 in Japan and reached gold status in the UK and Canada. Their 2006 debut, The Poison, has sold a million copies worldwide and certified gold status in America, the UK, Canada and Germany. Since those releases BFMV have rocked audiences on the Taste of Chaos, Mayhem, and No Fear festivals.